To Cite: Vejdan S A, Khosravi M, Zojaji F. Burn Donor Site Dressing Using Melolin and Flexigrid Versus Conventional Dressing, Shiraz E-Med J. 2015 ; 16(1):e26245. doi: 10.17795/semj26245. Background: Burn donor site care is one of the most important concerns in burn surgery. Traditional dressings for donor sites have some disadvantages, which interfere with epithelial growth and final results. Objectives: This study evaluated the role of a novel complex dressing in the management of donor burn site. Patients and Methods: After harvesting skin graft from the donor site, two different methods of dressing were selected. 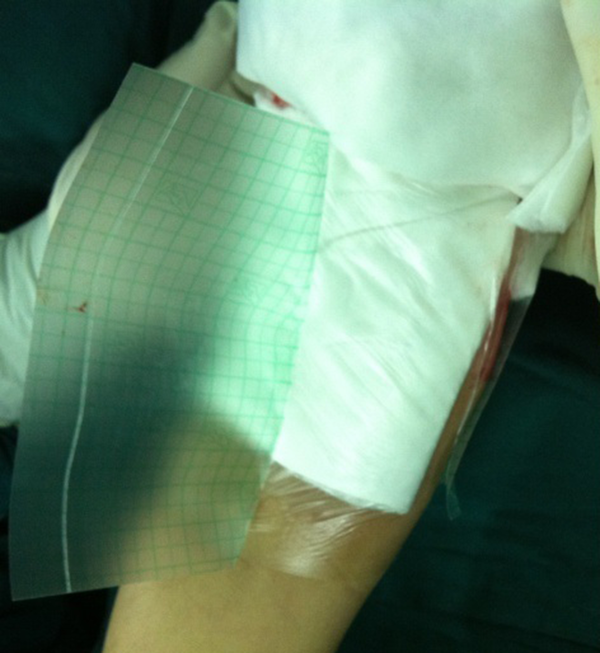 In control group (53 patients), traditional dressing was put on the donor site, but in investigation group (54 patients), a combination dressing consist of an absorbent dressing (Melolin) and a protective transparent film (Flexigrid) was used. Results: Epithelialization time was approximately 2.5 times shorter in the investigational group (P < 0.05). The infection rates were 4% and 21% (P < 0.05) in the investigation and control groups, respectively. Hospitalization time was decreased significantly, thus decreasing the final cost of about 25%. Cosmetic results were better in the investigation group and more acceptable than the control group. Conclusions: This new technique of dressing in burn donor sites not only can decrease the epithelialization time, but also can lead to better cosmetic results, lower infection rates and decreased final costs; thus, recommendable for all skin donor sites in burn. Patients with severe thermal injury are in immediate need of specialized care to reduce morbidity and mortality rates. Although the burn wound is the main goal of burn management, skin donor site is one the mostconcerns of patients care (1, 2). After harvesting skin from the donor site, the graft site itself can serve as a new wound that can in turn cause pain and discomfort for patient, and in some cases can increase the incidence of morbidity and formation of hypertrophic scars and keloids (3, 4). Consequently, care of donor site is crucially important for prevention of scar formation and delayed healing time and pain relief (1, 3, 5). Proper choice of dressing is of tremendous importance in care of burn patients. An ideal dressing would result in the least number of complications and require lowest degree of maintenance, resulting in an enhanced rate of recovery and minimal risks of hyperpigmentation and hypertrophic scar formation (6). Over time, a number of dressings have been developed. Therefore, during the re-epithelialization period, an ideal coverage for the new epithelium formation can be achieved within the shortest time and with best possible cosmetic results (4). Such dressings are subdivided into two types of old dressings impregnated with oils (Vaseline, paraffin, antibiotic ointment, etc. ) and new dressings. Traditional Fine mesh gauze dressings have been the primary type of dressings used by surgeons for donor sites due to their low costs and rates of infection and ease of usage (6). However, these dressings often become dry and adhere to the wound and result in pain and discomfort in addition to destruction of newly formed epithelium. In addition, such dressings are susceptible to bacterial infections and often fail to absorb the exudates (4-6). Among the aforementioned dressings, Melolin (a type of perforated polyester film) and Flexigrid (a semi-permeable film) are easily accessible dressings, which impose a small cost to patient. Therefore, we intended to assess the effect of simultaneous use of these two dressings compared to the traditional dressing. Eligible participants were all adults aged 15-35 years with deep burn wounds, which require partial thickness skin graft, burn surface area 20% to 50% without any history of chronic diseases or drugs (steroids or chemotherapy), which interfere with wound healing and no chemical or electrical burns. After obtaining signed consent form, patients (107 patients) were divided into two groups. Control group (53 patients) was considered for Fine mesh gauze dressing and investigation group (54 patients) as complex dressing (Melolin and Flexigrid). Data was collected using a form designed based on the objectives of study, includingepithelialization time, pain at the time of dressing (VAS from 1 to 10), scar [Vancouver Scar Scale (VSS)], donor site infection (cellulites, erythema, exudates and culture) and final cost. The study was performed at burn ward of Imam Reza Hospital affiliated with Birjand University of Medical Sciences, South Khorasan, Iran during 2012, which is a referral center for trauma and burn in the Middle Eastern part of Iran. Initially, for both groups, harvesting skin graft from the donor sites (thigh, back and chest) was conducted by one surgeon using an electrical dermatome (thickness of 1/400 cm). Then patients were divided into two groups by balanced block randomization. In the control group, donor sites were dressed by fine mesh gauze, which should not be changed until completion of epithelialization. For supporting this layer, surgeon put 2-3 more dry gauzes on it and completed the dressing using a pressure sterile bandage. On the next day, all of these layers were removed except for the fine mesh gauze. A heat lamp was used to dry fine mesh gauze in the next days. With this dressing, the wound has the opportunity to complete its re-epithelialization in the next weeks, starting from the edges. As the wound heals, the edges of the dressing are lifted up from the base and have to be cut until the wound site is completely covered with the new epithelium. However, in the investigational group a complex dressing consists of Melolin (7) and Flexigrid (8) was used. After taking full homeostasis of donor site, Melolin from the polyester film side was put on the wound surface and then one layer of Flexigrid fixed the Melolin over the wound and adjacent skin. No additional bandage or dressing was put on it. 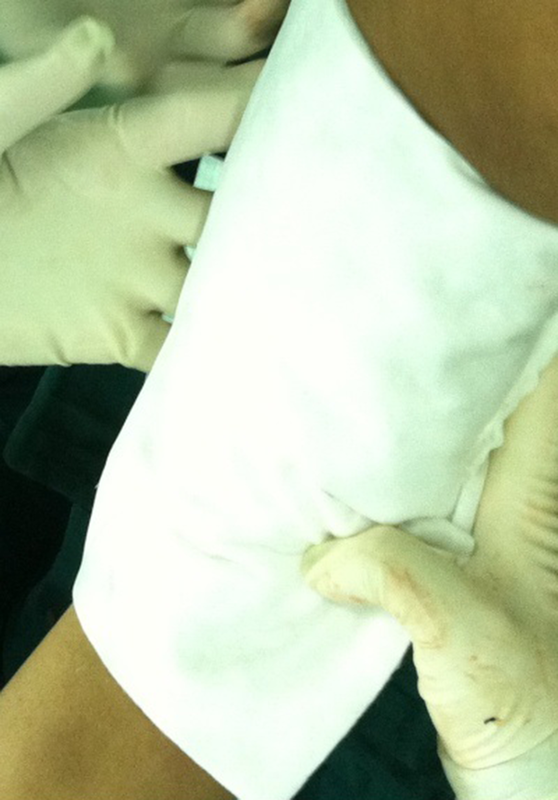 After three days, the dressing was removed and the wound washed with sterile saline and dried with a sterile towel, then a sheet of Flexigrid alone was put on it. This transparent dressing was changed every three days until complete epithelialization. The days after operation until complete healing of the wound considered as epithelialization time. VAS is the main scale to evaluate pain severity from 1 to 10. Hospital stay time and final cost were considered as the days after the operation until discharge of patients from hospital. . Infection was initially evaluated by the presence of cellulitis, erythema, exudates and approved by smear and culture. Scar formation was assessed using the Vancouver scar scale. All patients referred to our center who met the inclusion criteria, including 107 patients, entered the study. Corresponding surgeon could be able to choose either new or conventional method of surgery, according to a computer generated randomization list. Randomization sequence was created using balanced block randomization with a 1:1 allocation using random block sizes of 4. Determination of whether a patient would be managed by Fine mesh gauze or new dressing technique was made based on random numbers drawn up by the corresponding surgeon. In this study, blinding was not essential for each patient, because we did not evaluate the consequences of a specific method of therapy and the main variables were time and volume of bleeding There were no similarities of interventions between the two groups. A total of 107 patients were divided into control and investigation groups randomly. Fifty-four patients were placed in the investigation group with an average age of 26. 5 years and 53 patients in the control group with an average age of 25 years. In total, 55% of patients in the investigation group and 53% of patients in the control group were males. Pain severity evaluated by VAS was 4. 1 mean ± 0. 6 in the investigational group and 7.2 mean ± 0. 5 in the control group (P < 0.05). Complete epithelialization period in the investigation group was 9.1 ± 2.1 days and 19 ± 2.3 days in the control group (P < 0. 0001). Infection rates were 4% and 21% for the investigation and control groups, respectively (P = 0. 007). Hospital stay time in the investigation group was 17. 6 ± 2.1 days and in the control group was 29.2 ± 2.1 days (P < 0. 0001). The final cost imposed on patients in the investigation group decreased by 25% compared to the traditional dressings. Aesthetic results of the two groups were evaluated by a surgeon using a 4-point scaling system. Patients in the investigation group were commonly graded as 1-2, which indicate the best aesthetic result, while patients in the control group were graded as 3 or 4. We compared the results of a complex dressing consist of Melolin and Flexigrid versus standard fine mesh gauze dressing. The findings of this study indicated that use of these dressings achieves better results in graft donor sites. Traditional Fine mesh gauze dressing, which is a type of non-adhesive dressing, had been the primary choice used by surgeons for graft donor sites for decades, due to its low costs and ease of use (6). However, this type of dressing is commonly dried and requires frequent replacements, which in-turn causes bleeding and further trauma to the donor site. Increased trauma induced by maintenance of this dressing would ultimately interfere with the healing process and increase the re-epithelialization period with increased risks of hypertrophic scar formation (3, 4, 6). In addition, since these dressings do not absorb exudates, they commonly result in accumulation of fluid between the wound and the dressing with an increased risk of infection. New classes of dressings used on graft donor sites are of multiple classes. They include those impregnated with silver, transparent films, hydrocolloids, alginates, hydrogels and petrolatum gases (1). Silver impregnated dressings, such as Mepilex and Acticoat are commonly used for both graft donor sites and partial thickness burns (1, 9). The material used in Acticoat include silver Nano-crystals, which have an advantage of reduced need for replacement in addition to their antibacterial qualities (1, 5, 9). On the contrary, the high cost and lack of transparency of these dressings are some disadvantages. Biobrane is another new type of dressing,which provides long-term coverage. However, due to obstructive nature of this dressing, it is only used in partial thickness burns, where superficial infection has been clearly ruled out (1). Relative high cost of this dressing reduced its use among surgeons. In this study, we evaluated the effectiveness of a complex dressing. Melolin is a dressing composed of two layers. It consists of a non-adhesive, highly absorbent cotton and polyester fiber pad with a hydrophobic backing layer. The polyester layer has numerous small pores that allow exudates to exit and to be absorbed by the absorbent cotton layer (1, 2, 5). These small pores, due to their size, allow passage of exudates and water vapor, but do not allow introduction of microbial organisms. This dressing does not adhere to the wound site and would not increase trauma to the donor site new epithelium when replacing (10). Flexigrid is a type of semi-permeable transparent film, which allows passage of vapor (5, 11, 12), but is not permeable to water itself; hence it does not adhere to moist surfaces (12). The unique properties of these two dressings inhibit bacterial entry (8, 12), resulting in a sterile environment resistant to infection. Furthermore, the mentioned features of this dressing, such as providing a moist environment, antimicrobial properties, non-adhesiveness and reduced need for replacements result in a decreased length of epithelialization and consequently lower lengths of hospitalization. One of the other advantages of transparent Flexigrid makes the wound bed completely visible over the dressing; hence, in the event of fluid accumulation or infection, proper medical management can take place. In a study for non-surgical treatments of lesions of the finger, using Flexigrid was shown to significantly increase the rate of granulation tissue growth and formation of new epithelium by providing an optimal environment. In this studyconducted on 200 lesions of fingertips, after treatment course of 20 days with Flexigrid, appearance and growth of new epithelium were shown to be close to normal (13). Infection rate is significantly decreased using new dressing method compared to the Fine mesh gauze dressing (14). In this complex dressing, the absorbent cotton layer in Melolin absorbs the wound secretions, while the transparent Flexigrid allows close monitoring of the wound without removing the dressing (12). This quality along with bacterial resistance results in significantly reduced infection rates. The final cost imposed on patients in the investigation group decreased by 25% compared to the traditional dressings. Even though, the actual cost of dressing is slightly less for the traditional dressing; expedited repair of epithelium, reduced need to change the dressing, reduced need for hospital stay and reduced complications prove to decrease the total cost significantly when using this complex dressing. Moreover, other beneficial effects of Melolin and Flexigrid, such as reduced pain and more aesthetically pleasing results would further enhance the cost-effectiveness of this dressing. Pain is considered as one of the most common complaints in patients after surgical treatment of burn wounds with the graft donor sites often eliciting more pain than the receiving sites (4). One of the goals of the new class of burn donor site dressings is to reduce the pain severity of donor site after surgical treatment. The dressings used in this study, due to their non-adhesive properties, induce minimal trauma to the donor sites and require a reduced number of replacements, reducing pain levels after the surgery. In our study, pain score (VAS) had a significant decrease versus the control group (P < 0. 05). In a study aimed to treat painful diabetic neuropathy, Flexigrid was shown to be effective in lowering pain levels statistically significantly (15). In another study, where five different dressings for graft donor sites were compared, combination of Flexigrid with another resultedin minimal pain and cost to patients and used as the dressing of choice for donor graft sites (16). Overall, new dressings applied to donor graft sites aim at reducing common complications associated with traditional Fine mesh gauze dressings. The advantages demonstrated by this approach include: 1- shortened period of healing, 2- reduced pain 3- reduced costs 4- reduced infection rates and 5- aesthetically best results. The benefits of this method as mentioned above make it as an optimal candidate in graft donor sites in the management of burn patients.